I thought I’d give you a little light relief from answering your readers queries with the two attached photos taken while I was in Sri Lanka last month. 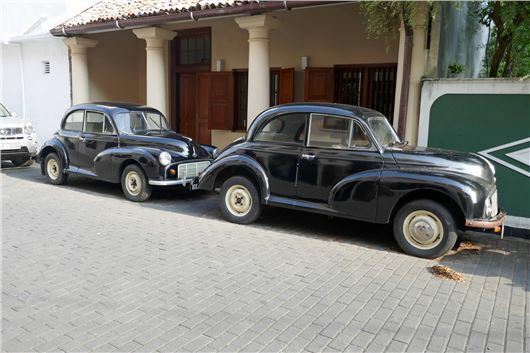 The two “old ladies” where found parked up in a side road in Galle – southern Sri Lanka. They both have split screens and a colleague of mine has dated them early – mid 1950’s. They looked in surprisingly good condition. The front (right hand) one has the semaphore indicator and a different headlamp design to the other. Actually Charlie Ware's Morris Minor Centre in Bath commissioned a lot of replacement body parts for Morris Minors to be manufactured in Sri Lanka and that helps to explain the condition of the cars you found. I would like to get a 4-seater cabriolet. My choice is between Mercedes E 250 AMG, Audi A5 quattro and BMW 6 series. Petrol only. Though we'll be testing it next month, the new E Class cabrio because it does not arrive until later this year. /carbycar/mercedes-benz/e-class-cabriolet-2017/?section=history/ The C Class cabrio in the photo is already around: /carbycar/mercedes-benz/c-class-cabriolet-2016/?section=history/ I'm not a fan of the A5 cabrio: /carbycar/audi/a5-cabriolet-2017/ 6 Series more like it, though now an ageing model: /carbycar/bmw/6-series-convertible-2011/ But will be a question of legroom for the people in the back. I always said I would never drive an automatic, but now I have a back problem that seems to be exacerbated by changing gear. I currently drive a BMW 218i Active Tourer and the obvious thing is to change it for an automatic version. I have always driven BMWs and I am wondering whether now is the time to consider other makes – but where to start? Do people often get wedded to one make? Stick with BMW. They all have reliable torque converter automatic transmissions. In the 2-Series Active Tourer these have 6-speeds for smaller engines and 8-speeds for bigger engines. I agreed to part exchange my car with a garage. The dealer inspected my old car and agreed a part exchange price. The deal was done and I collected the car. The next day the garage called to say that there is a problem with the engine. Surely it's the garage’s responsibility to check out any car they are buying as part-exchange? I have signed all the paperwork, paid outstanding amount in full and got the invoice signed by the dealer. Now the dealer is still holding on to the V5 and has given me only the green slip. Need advice, please help. Unless you misdescribed the car, stating it was in perfect condition with no faults (or something like that), there has been no breach of contract and you are not liable for any fault that the dealer later discovers. The dealer is expected to make a professional judgement and show due diligence in checking the car. If he fails to do so he has no comeback on the vendor, unless the vendor misdescribed the car. I have a 1997 Jaguar XK8 with 97,000 miles and a mix of specialist, dealer and owner services. Do you think it will ever be regarded as a valuable car? I visited my local Honda dealer with a complaint about a knock from the front left suspension of my Honda HR-V. On inspecting the vehicle they say there is a problem with the alloy wheels, in that the lacquer, is separating from the alloy. They say it is a warranty issue and Honda will replace the wheels. But, whilst at it, as the fronts have only 2mm rubber left and the rears 4mm, it would be a good opportunity to replace the tyres (mileage is 11,000 and I had hoped to get better than this from Michelin Primacy 3 215/55R/17 94V). I remember you writing that you had fitted Michelin All Season Tyres to your HR-V, which were very successful. Could you please let me know what they were exactly? Last year you gave me some good advice on clutch problems with a Ford Focus that I bought in August 2014. My claim against Ford in the small claims court was for £550 and I was awarded 65%. I alleged the clutch was not fit for purpose and the car also had 2 fly wheels with clutch paid for by Ford and 1 clutch they would not pay for. It is now 3 years old and I will be changing it. I would ask for your advice on 2 matters. Which finance should I use: PCH or PCP as I have never used either. I do under 8000 mls a year and would like to return in 3 years I do not wish to keep it. It will be automatic and like a Merc 220 or Audi 4, but could be any other car. I am 73 and this is only the 3rd car I have bought, so any advice would be appreciated. Thank you for the information. Personal Contract Hire is exactly that. You hire the car for the contract period then hand it back. Personal Contract Purchase is where you pay a deposit and fixed monthly payments then at the end of the term you have the opportunity to buy the car at a price pre-agreed at the beginning. That may be more or may be less than the car is worth. If you hand it back you will usually be charged for any damage. If I were you I'd look at a Mazda 2, a Mazda CX3 or a Mazda 3 automatic, all of which have an excellent 6-speed torque converter automatic. But I urge you to learn to left foot brake at low speeds at least in order to remain in full control of the car at all times. My car is a 2010 Golf Mk VI S 1.4 TSI 122PS 5dr. I am thinking of changing and getting the same model this summer. 1) Is this model still available? 2) Your thoughts on this model (any troubles!)? 3) If not available what is the replacement model you would recommend? In many reports I have read and also from hearing of accidents involving older drivers, one common factor appears to be that they are driving automatic cars where an accelerator pedal can be easily mistaken for the missing clutch pedal. After perhaps 40 years of driving with a normal gearbox suddenly to change to an automatic could explain this loss of control. Perhaps older drivers see an automatic as easier to drive, not having to change gear but when faced with a situation which requires an instant decision they revert back to clutch in and brake resulting in this type of accident. That is why I continually repeat my advice to drive automatics two-footed. Right foot for the accelerator. Left foot for the brake. And to ignore the ridiculous advice to "forget using your left foot" because that advice kills about 100 people a year in the UK alone. Using the left foot to brake at low speeds and while manoeuvring gives total control over the car and also enables the driver to stop the car instantly from low speeds. Had Mrs Ann Diggles been taught to left foot brake she wouldn't have driven onto the footway and killed Julie Dean on 7th July 2014. Diggles was tried for manslaughter in 2017 but got off because two similarly incompetent drivers testified that their automatic cars had "run away with them" and a stupid jury believed them. That is the idiotic mind-set set are dealing with. We are at the end of our tether with the poor aftersales service we have received from a Norwich car supermarket. We bought a Mazda 6 last December and very soon heard an intermittent noise that seemed to come from the rear brakes, as if they were binding. It was really frustrating as there seemed to be no pattern to it. Every time we went out we were listening for the noise and just haven't enjoyed the use of the car because of it. In spite of many phone calls, emails and turning up at the car supermarket, the various attempts by them have not cured the problem as it is still happening, even after the actions recommended by a Dekra engineer. What has been worse has been the lack of communication and customer care from the car supermarket with no one taking ownership of the problem and treating as though we have dementia (I am 73 and my wife is 66 and we're still working). After the last attempt to cure it we went to collect the car but the battery was completely dead as the ignition had been left on. In spite of a promise of a new battery, when the car was delivered to us hours later I discovered that it was still the old battery, which had just been charged, in spite of the insistence from the Customer Services representative that it was a new battery which needed 'several hours to settle down'. We were offered £10,500 from the car supermarket to buy it back from us, but that would mean losing £2,500 in the short time that we have owned it and we cannot afford to do that. What would you do in the circumstances? Presumably this is an automatic? If so, mpg was always the downside of the CR-V 2.0i. I only ever got around 28mpg from a manual. But 21.4mpg is truly terrible and either indicates a problem with the car or that you have repeatedly been using it for short runs from cold starts. I'd guess that its previous use as a Motability car has clogged up the catalytic converter. My 2011 Skoda Yeti, regularly serviced by the Skoda dealer and now at 26,000 miles has never had a change of DSG oil and filter. The explanation from Skoda is that the seven-speed gearbox is sealed for life but it is the six-speed box which requires replacement of synthetic oil rather than the seven as described in your piece of 1 April 2017.Thank you for your Honest John tips each Saturday Telegraph, always something of interest. No. That's completely wrong. The original 6-speed high torque wet-clutch DSG was designed as a maintenance box and requires fresh fluid and filter every 3-4 years. The clutches and transmission share the same fluid. It's designed for this job to be relatively easy to do. Even I could do it if I didn't mind getting my hands dirty. The 7-speed low torque dry-clutch DSG was designed to be maintenance free and was filled for life with synthetic fluid. The problem was, that fluid can become conductive at high temperatures and destroys the Mechatronics leaving the car with no drive. As a result, VAG was forced to institute a Worldwide recall to replace the synthetic fluid with mineral fluid and that should have been done to your car. These transmissions have been filled with mineral fluid on the production line since late 2012. VW PRs say it should not need to be changed again, but many independent VAG specialist recommend a further change every 4 years or 40,000 miles. If your fluid was originally synthetic and was never changed then if the transmission has not failed yet, it will fail. Following our previous emails, I am now looking for a 2011 or 2012 Range Rover 4.4 TD V8 because my use has changed to a mix of three drives per month of at least 150 miles each plus, say, six journeys per month of around 20 miles each, a total of 570 miles minimum per month. I am attracted to the diesel, despite the current negative comment in the media, due its better economy and greater torque. I enjoy relaxed cruising on motorways and A roads. Can I justify a purchase of the diesel under the above circumstances? It's an impressive spec, but EU5, not EU6, so, from September 2020 you would face a £65 a day penalty for bringing it into London. Here's our history of the L322: /carbycar/land-rover/range-rover-2002-l322/?section=history/ Click on Good and Bad for the problems. My wife has a five-year old VW Up that has done 13,800 miles, she has been advised to have the timing belt changed at a cost of £300 at a local garage. In view of the age and mileage what is your view? When does the Volvo XC60 petrol electric hybrid go on sale? The time has come to replace my trusty Peugeot 406 estate and my wife's automatic Nissan Note. With an increasing number of grandchildren, an automatic 7-seater would seem to be the best option. I have about £11,000 in total. What can you recommend? Increasing restrictions on non-EU6 diesels tend to put a diesel out of the picture, and £11k doesn't buy a diesel EU6 7-seater. If you can find a Ford S-Max or Galaxy with the 2.0 Ecoboost 200 or 240 engine and wet clutch Powershift transmission, that's probably the way to go. Maybe a Ford Grand Tourneo Connect 1.6 EcoBoost, which has a 6-speed torque converter automatic transmission. Good lord. So someone buys a car where the nearest dealership is 25 miles away. They then expect a service recall for no cost to them work to mean getting the car to the dealer and back should be at the dealer's cost. Are these people for real? Incredible. Really! Maybe not everyone has a plethora of dealerships on their doorstep. The dealer never rejected their custom when they purchased the car due to their residence being too far away. I have experienced the same as the local dealer switched allegiance meaning 2 days of my leave taken up dropping vehicle off and returning to collect. Is that fair given it was a manufacturing fault and no, received no recompense despite protests or offer to collect vehicle either. Believe manufacturers should be accountable for any out of pocket expenses incurred and at the least offer to collect vehicle with a supplied courtesy vehicle. Good lord. So someone buys a car where the nearest dealership is 25 miles away. They then expect a service recall for no cost to them work to mean getting the car to the dealer and back should be at the dealer's cost. Are these people for real? Incredible. IF it was a service I'd agree completely with you BUT it is a recall i.e the makers fault not the owners - If the dealer picks it up then surely that's fine ? Nice to see the two Morris Minors still in use in Sri Lanka. The one in front is the original design known to collectors as the "Low Light" version. Unfortunately the lights were positioned too low to meet American regulations at a time when most British built cars were destined for export, so the design had to be changed. Still banging on about left foot braking when you don't give any information about these, "about 100 deaths", caused by driving an automatic the way they are meant to be driven!! Where is the proof it was a COMPETENT driver causing an accident by driving with right foot braking? Where are the statistics that show many millions of drivers do not have a problem? If someone cannot control an automatic as it's meant to be driven they should not be on the road, FULL STOP. I went over to automatics 17 years ago, I have not had a single problem driving with right foot braking and the minute (and my wife tells me so) I do have a problem I will stop driving immediately. By the way I will be 80 next year. I am an avid fan of this web site and visit probably daily. I do, however, have to disagree with HJ and agree with Carquet & Nigel Dowe about the principle of trying to implement the practice of left foot braking with automatic cars. I have been driving for 50 years in both manual and automatic cars and to me, braking left footed is like me trying to write with my left hand. I was taught how to perform an emergency stop using both feet for brake and clutch and this action should be instinctive to any driver. Using the left foot on the brake because the car is automatic is more likely in my opinion to cause confusion and error. I suspect that many, if not most, runaways are probably caused by diesel engines running uncontrollably on their sump oil and taking their drivers by surprise. The combination of an oil overfilled diesel engine mated to an automatic gearbox could be lethal, and teaching its driver to brake left footed would not overcome the element of surprise leading to some of these accidents. I've clocked up 51 years of driving. Forty years of that on the roads of Australia driving automatics. Coming from a motorcycle and light plane background, I've always left foot braked. Been invaluable on a number of occasions when someone does something silly, that requires an immediate response.